Keith's work has appeared on book covers, children's books, t-shirts, album covers, posters, skateboard decks, and even a watch. He is a frequent contributor to The New York Times and New Yorker in addition to many other national publications. He received his BFA from the Milwaukee Institute of Art and Design in 2000, and his MFA from The School of Visual Arts in New York City in 2013 and doesn’t regret the student debt one bit. He’s won 4 medals from the Society of Illustrators, a medal from the Society of Illustrators West, and 2 medals from the 3x3 International Illustration annual. His book Tough Guys (Have Feelings Too) received a Kate Greenaway Medal nomination in 2016. 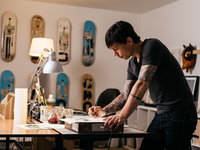 Keith resides in the mountains of Bellingham Washington with his Keith's work has appeared on book covers, children's books, t-shirts, album covers, posters, skateboard decks, and even a watch. He is a frequent contributor to The New York Times and New Yorker in addition to many other national publications. He received his BFA from the Milwaukee Institute of Art and Design in 2000, and his MFA from The School of Visual Arts in New York City in 2013 and doesn’t regret the student debt one bit. He’s won 4 medals from the Society of Illustrators, a medal from the Society of Illustrators West, and 2 medals from the 3x3 International Illustration annual. His book Tough Guys (Have Feelings Too) received a Kate Greenaway Medal nomination in 2016. Keith resides in the mountains of Bellingham Washington with his wife and two boys surrounded by giant spiders and teaches illustration at Western Washington University. Is this you? Let us know. If not, help out and invite Keith to Goodreads.